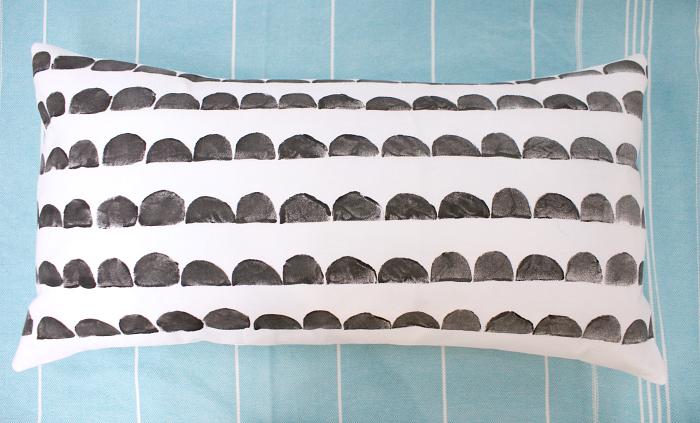 To be honest, I feel a teeny bit guilty about knocking off a pattern from Ferm Living. I absolutely adore their beautiful, crisp, geometric patterns and modern products. But, the bottom line is...the bottom line. 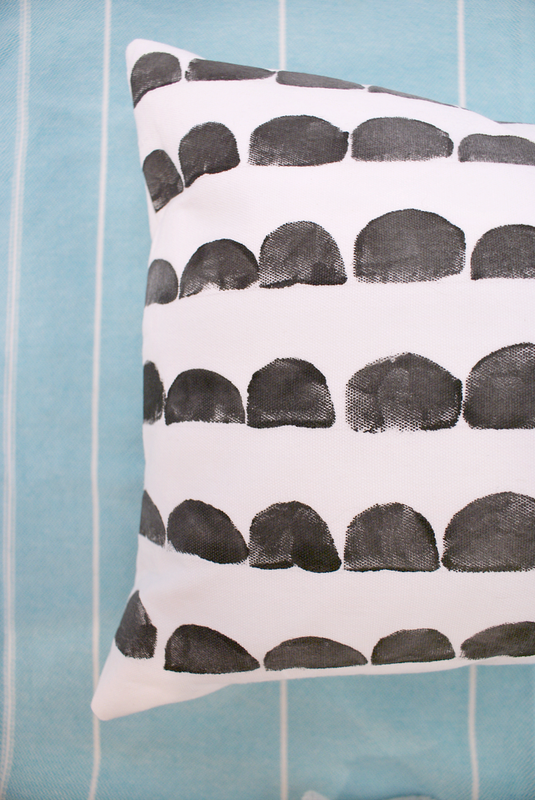 Eighty dollar toss pillows simply aren't in our budget right now. If you have the means, please do give Ferm Living your business, their products are so pretty and unique and (appear to be) first rate quality as well. If you are like me and want to "get the look" on the cheap, then read on! 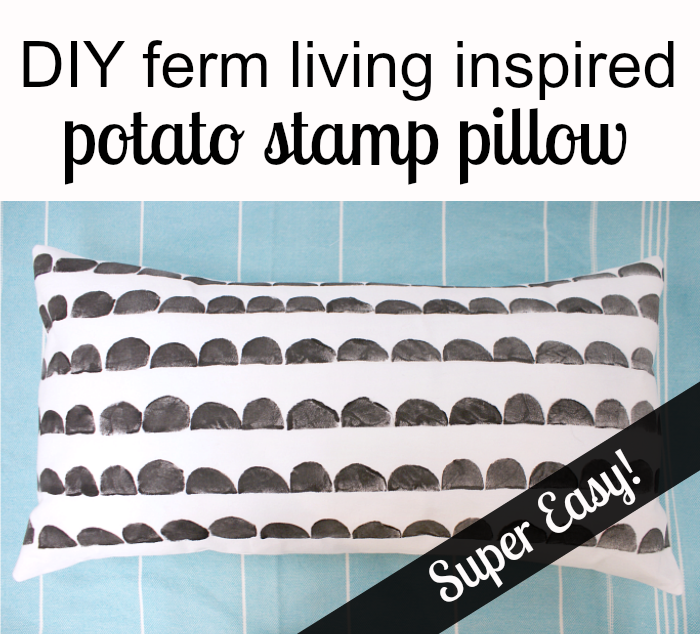 For this project, I made my own toss pillow with a half moon design by using using an old curtain panel and a potato stamp. Ha! That sounds so, MacGyver-ish, doesn't it?! Anyway, if you need instructions on how to make an envelope style pillow cover, this old post I did should help. If you aren't up to sewing, I think you could also use a basic white pillow protector, like this. 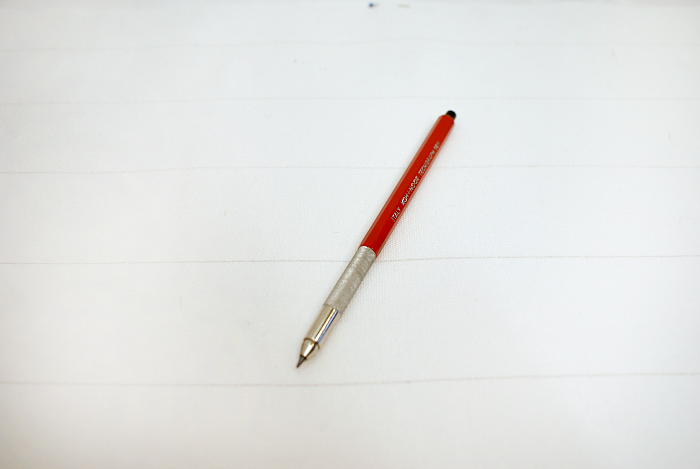 Start by using a pencil and straight edge to lightly mark evenly spaced lines on one side of your pillow cover. The pillow I made is 14 inches tall with lines two inches apart. Next, make your half moon stamps by cutting two small potatoes in half lengthwise and then down the middle. Make your fabric paint by using a small brush to mix black acrylic paint and textile medium together using the ratio on the label. This project didn't require much fabric paint, maybe an eightth of a cup total. Once your paint is thoroughly mixed up, brush it onto the cut side of the potato and then carefully stamp it onto the fabric, pressing down evenly before lifting up the potato stamp. If you are using a pre-made pillow case, sandwich a piece of paper between the front and back sides to keep the paint from bleeding though. Be extra careful when handling the potato stamps. I dropped one half way through and put a big blob of paint in the middle of my pillow cover, which meant it was done for. Sad face. The finished result is actually my second attempt! Continue stamping and swapping out potatoes to give the pattern a random look. When the pillow cover is finished, let it air dry for twenty four hours and then heat set the paint according the instructions on your textile medium. At this point, you could wash the pillow cover inside out on delicate cycle to remove the pencil lines. I figured with two dogs and a kiddo my cover will get washed often enough, so I just removed the pencil marks using a washcloth and soft brush. Aside from grade school art, this was my first attempt at potato stamping; overall it's pretty darn easy and very inexpensive! I'm wondering what else I can apply this technique to? Curtains perhaps? Have you used the potato stamp technique before? Love it! I might have to try this! Eek! I love your work, Michelle! I'm always stalking the prints available on OKL. Thank you so much for stopping by, completely made my day! Very cool idea! I would love it if you joined and contribute your awesome posts at my link party at City of Creative Dreams, starts on Fridays :D Hope to see you there at City of Creative Dreams Link Party.